In medium bowl, beat eggs and water with wire whisk. In shallow dish, mix crushed tortilla chips and Bisquick mix. If necessary, cut beef into 4 serving pieces. Dip beef into egg mixture, then coat with Bisquick mixture, pressing to coat. In 12-inch nonstick skillet, heat 2 tablespoons of the oil over medium heat. Add beef; cook 10 to 12 minutes, turning once and adding remaining 1 tablespoon oil, until beef is no longer pink in centre. 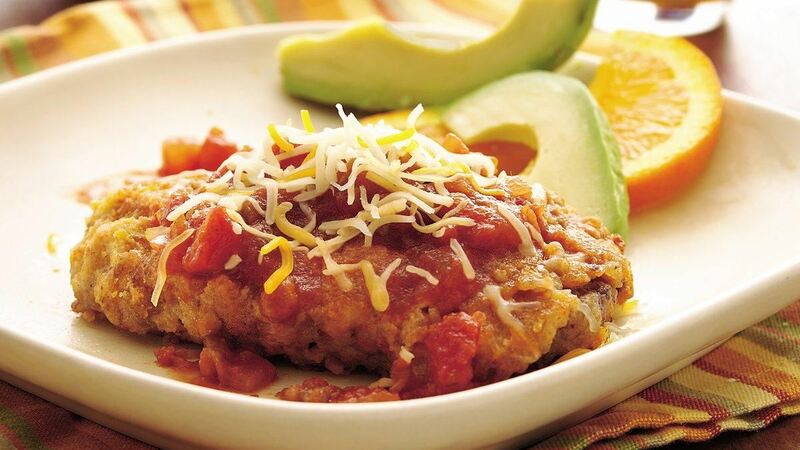 Top each serving with 2 tablespoons salsa and 1 tablespoon cheese. Success: Beef cube steaks are great to have on hand in the freezer. Thaw them quickly in the microwave for a speedy meal. Substitution: Use your favourite flavour of seasoned tortilla chips.